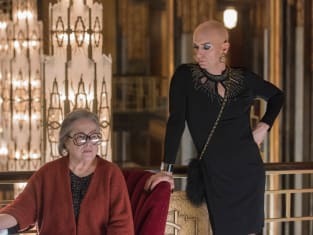 We got one less episode than usual with the Hotel Cortez as American Horror Story Season 5 Episode 12 was the season finale. And it was a happy-ish one which is in no way keeping with the tradition of going all-out gore-fest for AHS finales, but hey. What a strange way to wrap up a strange season. We got the scoop on all the ghosts and how they're spending their afterlives, a plethora of cast members returned for guest spots, and we got a callback to American Horror Story Season 1 with the reappearance of Sarah Paulson's psychic medium Billie Dean Howard. It was truly a banner episode, guys. Liz and Iris, such an unlikely duo, were the perfect pair to take over management of the Hotel Cortez. Marginalized in their first lives, running the hotel and creating a family out of the ghosts and guests gave them a chance to start over and have the lives they always imagined. AND we got a happily ever afterlife for Tristan and Liz! Their reunion scene was hands down my favorite moment. The Countess doubted that Tristan really loved Liz, but his "you had a lot of living left to do" as the reason why he didn't want to interfere with Liz's life was just...perfect. A little too 'advanced maturity' for the Tristan we knew before the Countess killed him, but hey, maybe being dead has that effect on people. Everything about Liz was praise-hands emoji perfect. She took control of Will Drake, made sure the hotel was financially solvent enough to stay afloat for years to come, developed a relationship with her son and his family, and then took control of the end of her life in much the same way she did when she first decided to stay at the hotel. Her life was her own, and it was good. 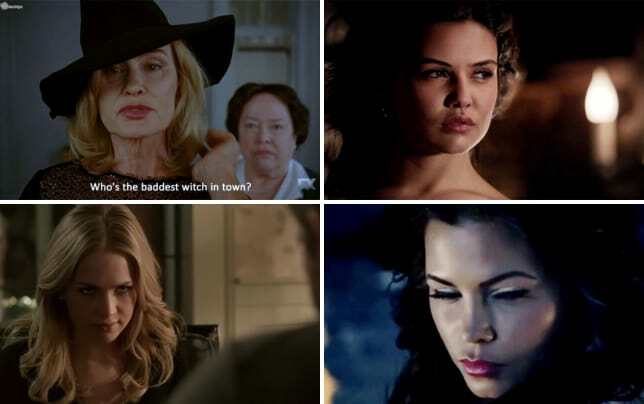 The Countess being the one to bring Liz into the ghost world was fitting since she was the one who originally convinced Liz to live as herself instead of who the world believed her to be, but I can't help but still sort of hate the Countess for killing Tristan in the first place. Meh. I'll live. Liz was happy. I'll be happy. Everyone will be happy. Especially Sally, who found a way to live, too. Thanks, internet! Who knew that all Sally needed to stop being a miserable murderess was a cell phone and Wi-Fi? What she didn't get was John, who died desperately trying to get onto the hotel grounds so he could spend eternity with his family. He should've been a little more careful with his murder spree to feed his own bloodlust and his wife and son. Oops? Iris got a touching word from Donovan, and the Countess discovered Devil's Night as a time to revel in her sexuality. By the way, why was Sally able to sleep with John while she was a ghost and he was human, and it seems as if the Countess is not able to do the same based on her encounter with the man at the bar? Maybe the Countess just wanted to murder the guy so he'd be stuck there with her forever, and he was the first one who came into the hotel who had the "jaw line for days" she craves in her male companions. Ultimately, "Be Our Guest" was about closure for all of the ghosts living inside the hotel and the lengths to which they were all willing to go to protect the life they've managed to create for themselves. Ordinarily we'd expect that all to be ripped away from them. Instead it seems as if these ghosts are getting a chance at a better life than they enjoyed when they were actually alive. My personal guess for how it all ends, in the fictional future of course, since Murphy just gave us his ending The Hotel Cortez isn't granted historical status, and the city tears it down, releasing those trapped souls into the city which will either send them all on a murderous spree or set them free. Bloodshed and body counts are typically high in finales for this series, so this was a bit of a shock and didn't feel especially like an ending at all. But I like it. Even damned souls deserve some sort of peace, right? What did you think of "Be Our Guest"? Did this feel like a fitting end for many of our characters? How do you see this season ending? Sound off in the comments below and then watch American Horror Story online! I'm dead, but I've never felt more alive. Permalink: I'm dead, but I've never felt more alive. Sally: You telling us to stop telling guests is like Colonel Sanders telling people to stop eating chicken. James: I'm not familiar with your military friend. Permalink: I'm not familiar with your military friend.